Investing in a new generation of leaders transformed by the person of Jesus, committed to peace building, reconciliation, dialogue, leadership with integrity and building of serving and caring communities. “This event was unlike any other I’ve ever attended”, “I returned home with the soul so rich and happy”, “These two weeks really changed me.” These and similar comments followed 2011 Renewing Our Minds Gathering (ROM), a two-week reconciliation, peace building and leadership gathering, held for the 13th time in the picturesque township of Fuzine, Croatia, from July 16th through July 31st. What made a difference in the lives of those who attended the event? We were an international group of fifty participants, facilitators and speakers, of whom 30 experienced a ROM gathering for the first time. The majority of participants came from the Southeast European countries, better known as the Balkans. Some came from countries associated with the former Soviet Union; while the rest came from the EU, USA, or even as far as Zimbabwe, New Zealand and Australia. Those who attended ROM for the first time, most of them young leaders with already considerable leadership experience, were thoughtfully recommended by a team of mentors in the international network of former ROM participants, and selected by a newly transformed ROM Development Council, an international advisory and strategy developing body committed to the future growth of ROM in the Southeast Europe and beyond. A feature that highlighted the event was the attendance of an organized group of six young leaders from East Europe: namely from Russia, Ukraine, Moldova and Transnistria. 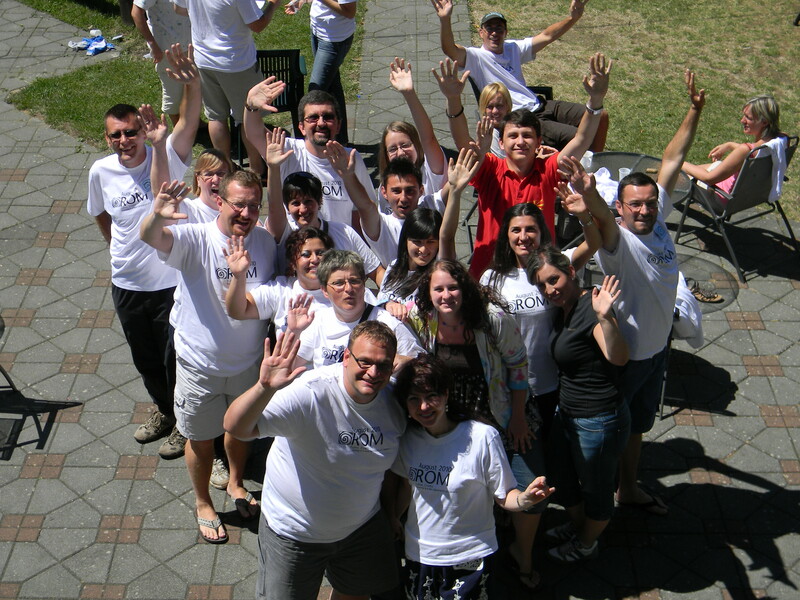 Attending 2011 ROM Gathering was deeply transformational for all of them, and enriching for everyone attending. Especially moving was the Empathy Night when they shared with the rest of the group the challenges they are facing as young leaders, and political and social activists in their countries. One of them reflected: “We did not realize how much we received by sharing without fear or being rejected by others. What was important to us was the atmosphere of unity and trust.” By the end of the gathering the group of six from the East Europe already had a preliminary plan in place to launch ROMEE in Ukraine in August 2012, a new East European ROM gathering that would target young leaders in up to 20 countries until now not reached by the existing ROM. Numerous comments of the 2011 participants show that the whole group, and not a few individuals only, was profoundly impacted by the way Jesus was presented foremost through the example of the serving team of facilitators and speakers. This was what the participants said repeatedly: “At ROM I’ve accepted Jesus in the most practical and personal way”; “I’ve tasted the love and happiness that God has even for people like me”; “My life will from now include God”. And there is something to be said about the program content too. It was informative and challenging, as well as motivational, relational and intended as a journey rather than a conference that aims at informing intellectually only. Its diverse but purpose driven content included: two-hour daily small group activities (the heart of ROM); sufficient free time aimed at encouraging personal reflection, prayer, journaling and individual interactions; educational entertainment activities; café dialogue sessions; well-selected movies; several moving sessions of sharing that provided intimate space for participants to share their own professional and personal lives and stories; and two speaking sessions per day delivered over two weeks by a team of 10 international speakers. Many political leaders, university professors, social and humanitarian activists, religious leaders, writers and business professionals volunteered their time as speakers and mentors at various ROM events in the past, including Economic Diplomacy Seminar — a very successful outgrowth of ROM directed by Justin Kagin from USA and Milan Pavlovic from Serbia, both ROM alumni. Some of them were Todd Becker, US Diplomat and former Deputy Head of the OSCE Mission in Croatia; Georgina Dufoux, former French Minister of social Affairs and personal adviser to President Francois Mitterrand; Vilma Trajkovska, wife of the late Macedonian President Boris Trajkovski; Randall Butler, mediation lawyer and Executive director of the Houston-based Institute for Sustainable Peace; Milorad Pupovac, Croatian politician and Member of Parliament; Lisa Sharon Harper, New York Faith and Justice Executive Director; Tony Hall, US Diplomat, former member of the US Congress and the Executive Director of Alliance to End Hunger; Scott Boldt, Lecturer of the Reconciliation Studies at the Edgehill Theological College in Northern Ireland; Miroslav Volf, author and Professor of Systematic Theology at Yale Divinity School. The thirteen years of ROM’s history prove that a genuine and long lasting reconciliation can take place around the person of Jesus between young leaders from diverse, even opposing ethnic and religious groups. Having learned from the painful experiences of the former-Yugoslavian wars in nineties of the last century, ROM leaders have been since encouraging young leaders of Southeast Europe and the world to adopt a new paradigm — one of forgiveness, reconciliation, empathy, peacemaking and leadership of integrity and service rather than one prompted by greed and self-serving interests. The words of two team members who served at ROM last summer explain why: “ROM is something that provokes you to push your limits. It takes you out of your comfort zone. ROM means a turning point. For some it is a beginning of a healing process, while for others a beginning of a long lasting change.” Adrian Moldovan, Romania. “What impresses me the most about ROM is to see that when people come to an environment that becomes safe, it is amazing what happens with them. Some of the most beautiful things I’ve ever seen in people have been at ROM.” – Zachary Schmidt, USA. This entry was posted in Faith, Human Dignity, Human Rights, Leadership, Peace Building, Reconciliation and tagged Albania, Balkans, Bosnia-Herzegovina, Bulgaria, Change, Conflict, Croatia, Following Jesus, Forgiveness, Kosovo, Leaders, Leadership, Macedonia, Moldova, Montenegro, Peace Building, Reconciliation, Renewing Our Minds, ROM, Romania, Russia, Serbia, Service, Transformation, Ukraine, War, Young Leaders, Young People. Bookmark the permalink.